Here's another card from my Onstage Live presentation, featuring the Cake Soiree bundle. Again, this is a card that goes together rather quickly - and features lots of products from this beautiful suite. 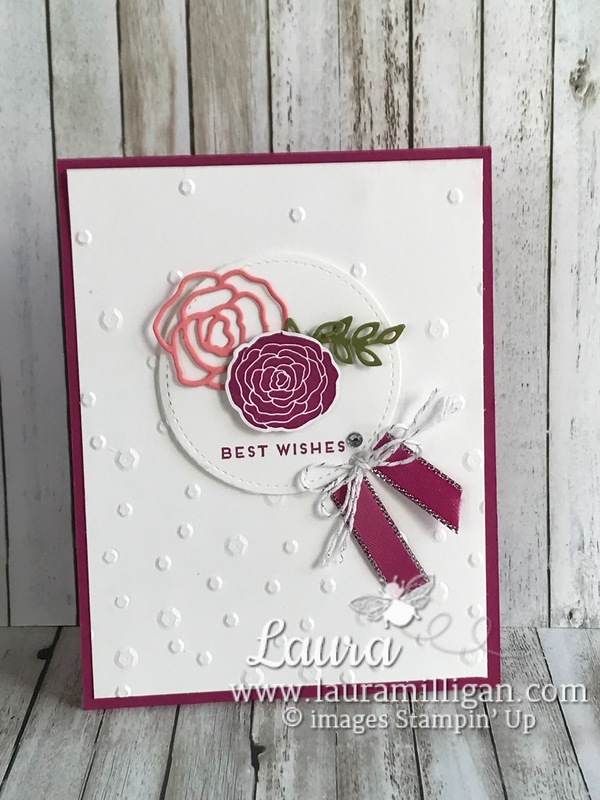 To create this card, I started with a base of Berry Burst cardstock. I embossed a panel of Whisper White cardstock with the Scattered Sequins Dynamic embossing folder. I stamped a flower from the Cake Soiree stamp set and used the coordinating framelit and my Big Shot to cut it out. I also cut a leaf and the pretty delicate floral shape with framelits from the Sweet Cake framelits dies. 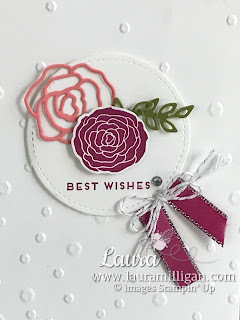 To finish my card, I cut a circle using the Stitched Shape framelits, and stamped "Best Wishes", I adhered the flowers and leaf, and added a rhinestone. This entire layer was popped up with dimensionals. A bit of the new Metallic Edge Ribbon and Silver Baker's Twine added the finishing touches. The stamp set and framelits are bundled to save 10%! The good news is that even at the discounted bundle price, purchasing the bundle still qualifies you for a free Saleabration award! Below are the clickable links that will take you to my online store so that you can purchase these products! I would be very grateful for your order! Please check back, I have A LOT more to share with you with projects I've created with this amazing bundle!